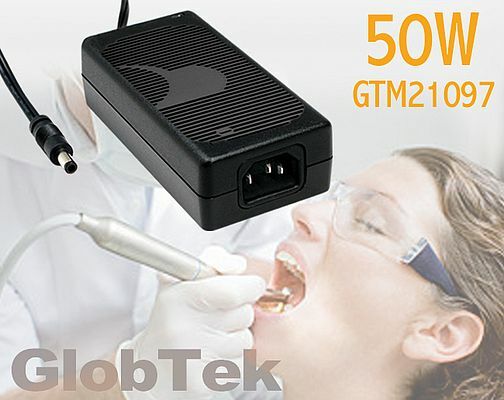 Providing a regulated output with very low ripple of up to 50W, GlobTek's GTM21097 family of medically-approved switching power supplies are intended for use in driving portable medical devices and charging their battery systems. Provided in an impact-resistant non-vented polycarbonate case, the conduction-cooled power supplies deliver an output voltage from 3.3V to 48V (in 0.1V increments) at 36W to 50W from a 100VAC to 250VAC input. Built-in Protection features include overcurrent, short-circuit, overvoltage, and thermal, and safety agency requirements include UL2601, CSA 22.2#601, and TUV EN60601 as well as EMI/RFI Regulations, EMC Directives/ CE and FCC Class B for grounded medical applications and CB Certificate, Report and SIQ Mark to 60601-1 3rd Edition. All models also carry UL, TUV, and CE-Mark Report generated by independent certified laboratory. Versions are available with constant-current operation and other features for battery charging, and modified and custom designs are also available. A "made in USA" option is available upon request.